Construction: The yoke of this cardigan is knit seamlessly from the top down. Sleeve stitches are then put on hold while body is worked (button bands are worked as you go). Then sleeves stitches are put back on needles and worked in the round. Stitches are then picked up along the front neckline to work the applied I-cord edging. A few stitches are picked up at underarms to work I-cord tie closures. 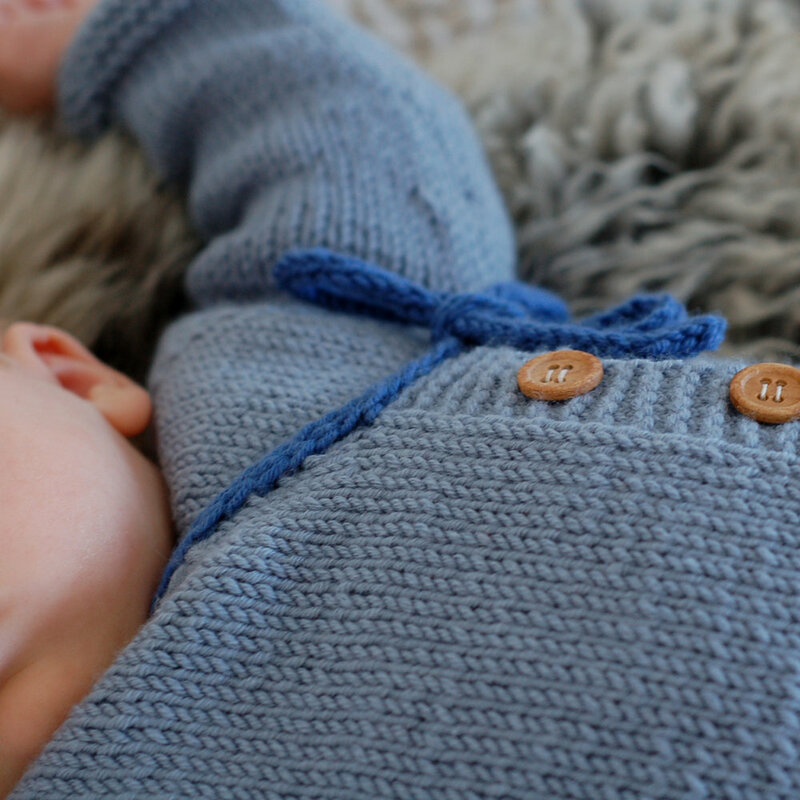 When my children were born, I had an overwhelming feeling of gratitude and I thought a simple word, “merci” (French for thank you) would be a fitting name for this simple wrap cardigan. As a new mother, I found such crossover garments to be particularly practical and sweet for a new (or not so new!) baby. They look great over simple pajamas or dressed up with a more elaborate outfit. The beauty of this particular design is that it’s very gender-neutral. If you don’t know whether a new baby will be a boy or a girl, you can choose a neutral hue, and just add the color accents once the baby has arrived :) This design also looks beautiful when monochromatic. 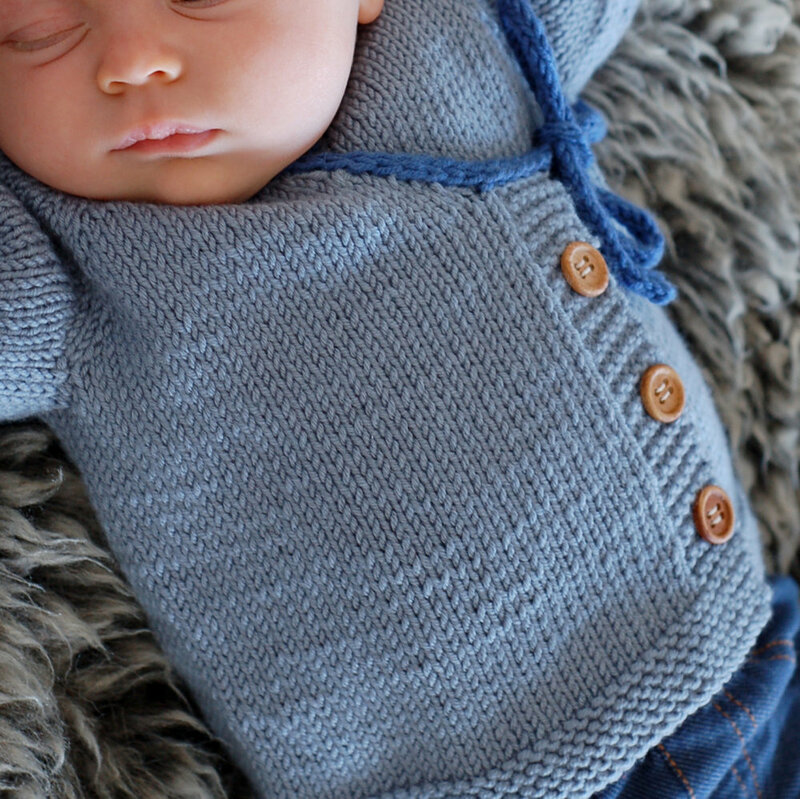 A FREE one-size (Newborn) version of the pattern is exclusively available to my newsletter subscribers. Garment chest: 18.25 (19, 20.25, 21.75 // 24, 25.5, 27.75, 29) inches or 46.5 (48.5, 51.5, 55 // 61, 65, 70.5, 73.5) cm. Main Color (MC): Approximately 350 (350, 400, 425 // 500, 575, 600, 675) yds or 320 (320, 366, 389 // 460, 526, 550, 615) meters of sport (5 ply) to dk (8 ply) weight yarn. US4 or 3.5mm circular needle in 24-inch or 60cm length or size needed to match gauge. Note: body of garment is not knit in the round. However, circular needles are needed because they hold all the stitches easily and because of their flexibility. 22 sts x 32 rows = 4 inches or 10 cm in stockinette stitch.